From March 13–15, 2018, LOPEC, the international exhibition and conference for the printed electronics industry, will take place for the tenth time. As the leading event in this sector, it has always covered the entire value chain—from materials development and plant engineering to applications. In this interview, Hans-Jürgen Lemp (Director Global Sales & Business Development New Platforms, Merck KGaA), Thomas Kolbusch (Vice President, Coatema Coating Machinery GmbH) and Dr. Wolfgang Clemens (Head of Product Management, PolyIC GmbH & Co. KG) talk about a decade of printed electronics and the markets of tomorrow. Mr. Kolbusch and Mr. Clemens, you presented your companies at the first LOPEC in 2009. Do you still remember it? Progress in printed electronics depends on new materials. What has happened over the past decade? Printed electronics has developed very quickly. To what extent has LOPEC changed over the years? Where is the greatest potential for printed electronics at the moment, in your opinion? What role does LOPEC play in realizing future trends? Thank you for the interview and good luck at the upcoming LOPEC! Whether it be OLEDs, smart packaging or test strips for diagnostic purposes, printed electronics is conquering mass markets. 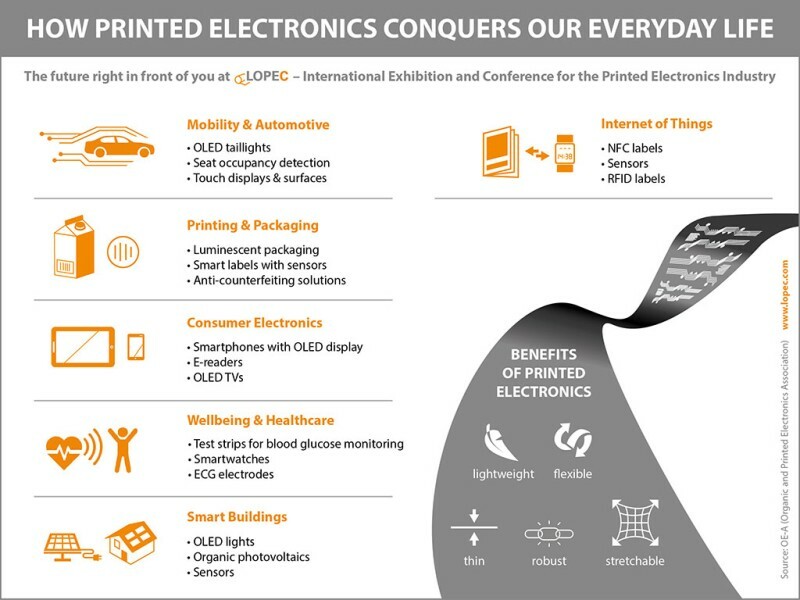 One reason for this success is LOPEC, the international exhibition and conference for the printed electronics industry which will take place for the tenth time in March 2018. The first “Large-area, Organic & Printed Electronics Convention” to give the event its full name took place in Frankfurt am Main in June 2009. In 2012, LOPEC moved to Munich, where it is organized by the OE-A (a working group within the VDMA) together with Messe München. LOPEC has been a success ever since it started: At LOPEC 2017, there were 154 exhibitors—three times as many as in 2009 and 50 percent more than in 2012. At the same time, visitor numbers have increased from 600 in 2009 to almost 2,600 in 2017. Around one in two visitors and exhibitors is from abroad. While visitors to the trade fair can meet the big names from the sector and admire their new products, renowned industry experts present the latest trends in around 200 conference presentations. In order to cover all areas of printed electronics and meet the needs of the sector in the best way possible, the LOPEC conference is subdivided into various modules: the Plenary Session, the Business Conference, the Technical Conference, the Scientific Conference as well as Short Courses, the Start-up Forum, and the Poster Session. The positive development looks likely to continue as printed electronics remains a growing industry. According to the business climate survey by the OE-A, more than 80 percent of members surveyed expect the sector to continue growing in the coming year. The companies predict a 16 percent increase in turnover in 2018.